Gilchrist initially responded by filing a lawsuit against the board members and waging a public relations battle in which he claimed the Minuteman Project had been "hijacked." Then, in April, he suddenly dropped the lawsuit and incorporated a new competing organization: "Jim Gilchrist's Minuteman Project." While the so-called hijackers retained the Minuteman Project's membership list, office equipment and stationery, control of funds raised under Gilchrist's leadership remains in dispute. The power struggle first came to light early this year, when three members of the Minuteman Project's board of directors — Barbara Coe, Deborah Courtney and Marvin Stewart — announced that they had fired Gilchrist and seized control of the organization's bank accounts and website. Coe (who has since resigned from the Minuteman Project), Courtney and Stewart told the Los Angeles Times in early March that as much as $750,000 is missing from Minuteman Project accounts. Prior to that interview, they publicly accused Gilchrist of embezzling $13,000 from the Minuteman Project to pay his own legal fees and of illegally diverting another $400,000 in donations to his failed 2005 Congressional campaign and to promote his book Minutemen: The Battle to Secure America's Borders, published last year. Proceeds from sales of the book, they note, went to Gilchrist, not the Minuteman Project. Gilchrist has flatly denied any wrongdoing. "There's no $400,000 of hidden money, there's no hidden bank accounts, there's no hidden P.O. boxes," he told The Associated Press. "I've done 1,000 media interviews and I don't have time to cross every 't' and dot every 'i'." 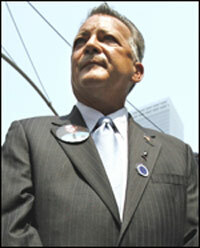 Gilchrist said his opponents are motivated by "a greed for power and a false perception of an endless stream of money." The Minuteman Project has 24 chapters in 20 states and roughly 200,000 dues-paying members, according to its fundraising materials. It's unclear at this point how many of those members will jump ship to Gilchrist's new organization. "You can't create a new Minuteman Project," Stewart told the Los Angeles Times in April. "There is already one, and I'm the president." Stewart, who Gilchrist calls a "delusional whiner," may be overestimating the importance of his title. Gilchrist is a much bigger celebrity in the citizens border patrol movement, and many of his followers are faithfully rallying to his defense. Two weeks into the controversy, on March 5, Barbara Coe abruptly resigned from the Minuteman Project under intense pressure from pro-Gilchrist members of her California Coalition for Immigration Reform (CCIR), the major anti-immigrant hate group that Coe founded in 1994 and still leads. Three days before she announced her resignation, Coe posted a message to the CCIR website praising Gilchrist as a "courageous patriot and a man of honor and integrity," and seeming to suggest that Gilchrist was not personally responsible for the allegedly missing and misspent funds. "Documented data indicates that certain business transactions were made without Jim being advised of the legalities involved and without knowledge or approval of the MMP board members," Coe wrote. "I consider Jim a victim of those who have actually betrayed his trust." Courtney and Stewart continue to stand their ground and point accusatory fingers at Gilchrist. "We had the opportunity to unite the forces fighting the invasion of illegal aliens, but that chance was squandered by Jim Gilchrist and his underlings," Courtney said. "Now, they are trying to destroy the organization, because Jim Gilchrist believes that he is more important than the issue, the movement, or the members that placed their trust in him." In an interview with the Intelligence Report, Courtney said she was especially angry about the missing money because she had personally bankrolled the Minuteman Project to the tune of $40,000. "I funded Gilchrist," she said. "They owe me a lot of money." Stewart, meanwhile, continues to accuse Gilchrist of "spinning lies." "We know this is hard for many of you to understand, given that Jim is still not coming clean or being truthful in the media," Stewart wrote in a recent letter to Minuteman Project members. "But we are confident that the truth is on our side, the facts will prove us right, and with God's help, in the end we will prevail, even if Jim does manage to bring down the whole movement."